The House of the Lord also known as the Kirtland Temple, was constructed by the prophet Joseph Smith and others in 1836. 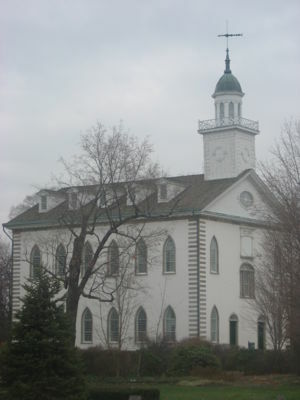 The Kirtland Temple stands on a bluff in northeastern Ohio, about 25 miles east of Cleveland, overlooking the beautiful Chagrin Valley. It is 15,000 square feet in size, the design was an adaptation of Federal Georgian and New England Colonial. It consists of three floors; lower hall for worship and an upper hall for church leadership education and the third floor used for classrooms and administrative offices. Abandoned in 1838 when the Mormons left Ohio for Western states. The third story was converted into a school where former United States president James Garfield was educated. It was purchased in 1880 by Community of Christ (the former Reorganized Church of Jesus Christ of Latter-day Saints) and restored as close as possible to its original condition. Local materials were used in its construction. Two miles south of the Kirtland Temple, stone was harvested from the Stannard Stone Quarry, now a state Metro Park. A local saw mill used in construction of the temple has been restored and is operational. It operates on water power and could handle logs 16 feet in length. During construction between 1833 and 1836, the Kirtland Temple was guarded at night to protect the building from threatening mobs and vandals. The completed temple was dedicated by Joseph Smith March 27, 1836. Read Original Dedicatory Prayer Many significant events took place in the temple including: translation work, the teaching of Hebrew, and several revelations received including the vision now recorded in D&C 137 concerning the doctrine of salvation. The temple is no longer used for worship services but meetings and tours are conducted there. This page was last modified on 13 July 2016, at 09:08.